Intensive multi-mode training paired with followup coaching. The most effective manager training method available. Many training companies list 100s of course titles, each covering dozens of topics. This makes for very effective marketing because we think we're getting more for our money. Unfortunately what most of us really need is more focus on retaining and applying key fundamentals. In other words we need help staying focused and working through any initial rough spots for long enough to make new habits stick. Once it really sticks we start applying things in our daily lives. When you learn 10 new things in a day you very often end up not really learning much of anything. That's why 2 weeks after a great seminar everyone's back to their old behavior. We don't like that. That's what we teach. One at a time. The best athletes, entertainers and business people all use coaches to be and stay the best. There is simply no substitute for the regular support and encouragement of a safe coaching setting. We all need a little support over time to adopt new habits and get rid of old ones. That's what our coaching environment provides. Because grasping a new idea is just the tip of the iceburg. The real challenge is getting new ideas to stick. Used by elite athletes and the US military, highly focused cycle training is the way to become the best. Say you want to learn how to throw, hit and run. When you come back to throwing focus 3 weeks later you start from a higher plateau and take improvements to an even higher level. We didn't invent it, but we do take advantage of it. It's basic human psychology and a best practice in human performance improvement. All day seminars are fantastic for networking and team building, but not for retained and applied learning. 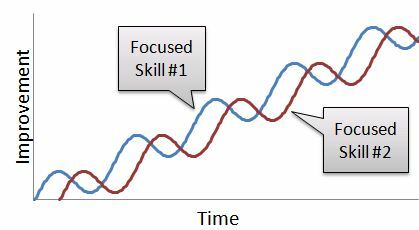 For lasting change nothing beats a series of much shorter training bursts followed by personal reinforcement over time. The magic formula is a training/coaching combination for learning retention and lasting results. Not only do different people learn best in different ways, but everybody also learns better when taught in multiple ways. We mix up our training into bite-size modules to make it easy to consume. Then repeat common themes in different ways to help them stick. Our basic survival instincts put more trust and belief in recurring, repetitive messages - it's just part of how the human brain works. Not long ago it was expensive to train like this because trainer and student had to physically go to so many classes and events. The only real option was a dedicated personal trainer and coach. The Internet has changed all that making a 30 minute session take only 30 minutes instead of half the day getting to and from the meeting. Never before has this type of training been so accessible and affordable.